We love our Westies, but maybe not their barking. Barking is a natural dog behavior and sometimes its okay when our furry little friends are trying to communicate, but sometimes they just don’t want to shut up. 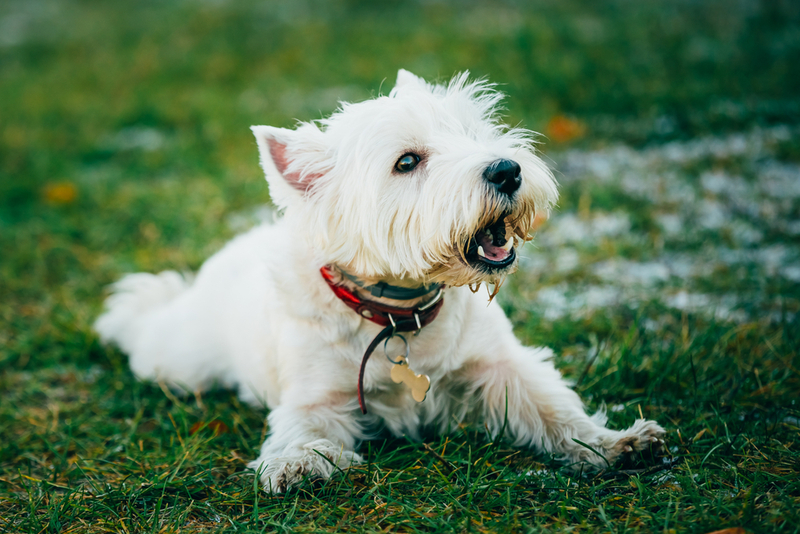 If you have a West Highland Terrier that is constantly barking, here are a few tips that you can use to stop (or at least reduce) your Westie’s barking. 1. Make sure your Westie isn’t barking out of boredom. We (humans) are able to easily cure our boredom. We can turn on the television, take ourselves out for a walk, play a game, or read a book. Dogs don’t have these freedoms that we have so they mostly do what we allow them to do. Since Westies are very active dogs, they can easily get bored if they don’t have enough of activity or socialization. As a dog owner, you have to be aware of your dog’s temperament so that if your dog gets bored easily, you need to be willing and prepared to alleviate this symptom. Westie enjoy playing with balls, exercise, walks, and most importantly, attention. If you provide relief from boredom, you can stop Westie barking right in its tracks. 2. Tire Your Westie Out. This is almost along the same lines as your Westie being bored. In general, if a dog is very tired, they are going to be quiet. They will go somewhere to lay down and rest. If your dog is barking too much it could be a sign of pent-up energy that needs to be burned. Take your dog on a long walk or run, or give him/her some sort of activity that will keep them busy for a long time. 3. Praise Your Westie at the First Bark. This may seem contradictory since you want to stop Westie barking. It would seem that praising the first bark would encourage your dog to bark again for more praise. Dogs often bark to alert you to something or to get your attention. Often times if you recognize this on the first bark, it can stop them from barking and the praising will teach them that one bark is enough in the future. 4. Tell Your Westie “No” When They Continuously Bark. Westies are very intelligent dogs. They can pick up on your commands very easily, so when you tell them “no” they will understand that you don’t want them to do something. Telling them no often when they constantly bark will help to teach them not to bark constantly. It may take a bit of patience, but eventually they will get the message. Don’t yell at your dog when you tell them no. Dogs don’t understand volume in the way that humans do. To dogs, yelling just sounds like noise. If you yell at your dog, they may just interpret this as incessant barking and they may reciprocate the action. This is exactly the behavior that you want to avoid. The mailman, or any delivery person, is regarded as an intruder to a Westie. Westie are excellent watch dogs, so the moment someone approaches your home they begin barking to alert you to their presences and scare the intruder away. Once the delivery person begins to leave, the Westie thinks that it was their barking that ran the intruder off and the behavior is encouraged. The key here is to not discourage your Westie’s natural watch dog instincts, but rather to control them. This can be achieved by careful and consistent training. It will be much easier for you if your delivery person can cooperate with you and your deliveries come at or around the same time. As soon as your Westie begins to bark at the delivery person, give your Westie a treat. This is rewarding him or her for the good behavior of alerting you to the delivery person’s presence. If the delivery person cooperates, ask them not to leave after immediately dropping off the mail or packages. This gives you time to tell your Westie to stop barking. When your Westie stops barking, the delivery person leaves. After you practice this with your Westie for a length of time (time varies by dog), your dog will begin to catch on and understand that the delivery person will leave on their own. If the delivery person can’t cooperate with your training, you must tell your Westie to stop barking before they leave so that the lesson sinks in. This may require careful timing each day. 6. Teach Your Westie to Be Quiet on Command. This sounds easier said than done. This will take an incredible amount of patience and understanding but West Highland Terriers are smart dogs, so they will catch on. In order to teach them how to be quiet on command, you will first need to teach them to bark on command. Yes, this is another contradictory piece of advice–you want to know how to stop your dog from barking, not how to get them to bark more. Trust the process–it works. First, you teach them to bark on command by giving the command “bark” or “speak”. Allow them to bark a few times and then put a treat in front of them, but don’t give it to them immediately. Wait for them to stop barking and then give them the treat. Continue this process and remember it can take a bit of time for your Westie to learn this trick. Once your dog has mastered barking on command, you are ready to teach your dog to be quiet on command. Tell your Westie to “bark” or “speak”. Then tell your Westie to be quiet. As soon as he does, give him a treat. Repeat this process until your dog understands the command. Keep in mind that in order for the training to work effectively, the treat must be given immediately after the dog obeys the command, like in a matter of seconds. Dogs have short attention spans and if you let too much time pass before giving the treat, they won’t know why you gave it to them. This may be the most difficult way to deal with barking because it means that your Westie is going to incessantly bark until they realize that the barking gets them nowhere. Have patience and don’t let the barking drive you nuts. When your Westie barks, they want your attention for some reason, so not giving them attention will make them realize that the barking isn’t working. In order for this to work, you must completely ignore your Westie. This means don’t say anything to them, don’t touch them, don’t look at them. When your Westie stops barking, you can reward them with attention or with a treat. Repeat this each time the start barking and eventually they will understand that barking is not the way to get what they want. 8. Ease Separation Anxiety in Your Westie. One reason that dogs constantly bark or howl when you aren’t home is separation anxiety. This is a common problem for dogs. Separation anxiety is occurs when a dog is distressed about being separated from the human(s) it is attached to. Separation anxiety doesn’t just result in unwanted noise from your Westie. It can be dangerous for your dog because they may hurt themselves in an attempt to escape depending on how severe their anxiety is. In order to ease separation anxiety, you need to change your Westie’s bad feeling about being left alone to a positive feeling. This can be accomplished by giving them a long lasting treat that they only get when you leave. For example, a frozen Kong toy with a yummy treat inside will keep them occupied until you come back home. If your dog has severe anxiety, a long lasting treat may not work. You can try to get your dog accustomed to being alone by starting off with short trips away and gradually making them longer, but if you have to work or other similar reasons, you may not have this convenience. In this case, you may need to seek professional help. 9. Hire a Professional Trainer. You can save yourself time. This is good if you have a busy schedule. Professional trainers have a lot of experience with training dogs, so they know what works and what doesn’t. Professional trainers have a lot of patience when it comes to training dogs, so they will be persistent in training your Westie. Professionals will be better in areas where timing is key, such as giving the treats in a timely manner. Someone else will do the work while you reap the benefits making your life easier. There are different types of trainers depending on the needs of you and your Westie. A regular trainer (not certified) would be someone who has a lot of experience with dogs but hasn’t necessarily received any type of professional education about dogs. Certified Professional Dog Trainers have earned certification from The Certification Council for Professional Dog Trainers. This means that they have gone through a rigorous dog education program that includes hands-on experience and they have passed standardized testing proving that they are knowledgeable in the field. Applied Animal Behaviorists have college degrees (Master’s degrees or higher). They have studied animal behavior at an accredited college or university and are experts in the field. Whatever type of trainer you choose to help with your Westie, always do thorough research and background checks to ensure that your trainer is knowledgeable enough to help you. They should have great references and should always be professional with you and your pet.